Feel at ease when you contact us to get your property power washed as we offer quality work at reasonable prices. 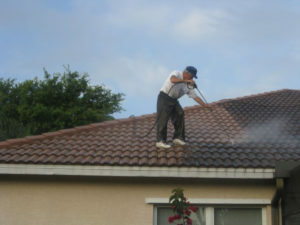 Our company is fully insured and licensed in Collier Country to do residential and commercial pressure washing services. What does this mean for you as a customer? That we have the insurance and general liability to cover anything that can go wrong while pressure cleaning or power washing your property. Have the ease of mind to know that your patio furniture and your planters will be in good hands; that the walls of your building will not be damaged when we are doing a paint preparation for you. Proof of insurance and licenses are just a phone call away at 239-304-0285, get us out to the job site and not only get a free estimate but see that we are a professional company that will get the job done right in a timely manner. You have a busy schedule and we can see the hassle of getting the exterior cleaning of your home or office a task for “tomorrow”. Enjoy what you have worked so hard for and keep it looking nice and pressure clean. It will take you only 1 minute to either call us or fill out our quick quote form below to receive the best pressure washing prices & rates.